TRAIL, BC (November 5, 2018) – In recognition of the 100th anniversary of the end of the First World War, the Trail Museum & Archives is honoured to present an exhibit recounting the experience of Trail solider, Jimmy Schofield. The exhibit, entitled The Affectionate Son: The Great War in Words, 1916-1918, opens officially on Wednesday, November 7 in the Trail Museum & Archives’ Columbia Gallery. 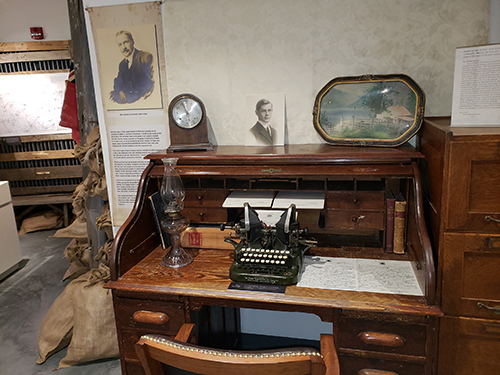 The Trail Historical Society was gifted a fascinating collection of over 150 letters from Private James P. Schofield to his mother, father, sister, and brother from June 1916 – November 1918. James Peverley Schofield was the son of former Trail mayor and long-time Conservative MLA James H. Schofield. He joined the war effort in June 1916 and spent several months at Camp Hughes in Manitoba undergoing training. After a tortuous journey to England in November 1916, Jimmy eventually found himself in the French trenches by February 1917. Wounded three times, his career in the military spanned from message relay to the Canadian Machine Gun Corps. The exhibit uses Jimmy’s words exclusively to recount his journey, with excerpts from 38 of his letters home. 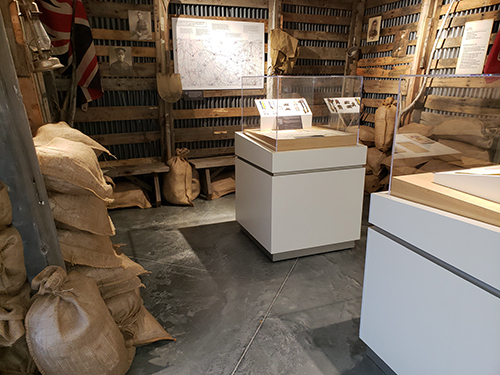 The exhibit also invites visitors to experience life in a trench and provides some insight into the life of MLA Schofield, whose conservative politics were campaigning for conscription at the time. A detailed trench map identifies both British and German trench lines and traces Jimmy’s route through the last few months of the war. The exhibit is open to the public during regular Riverfront Centre hours. Entry to all museum galleries is free of charge. The Trail Museum & Archives was pleased to collaborate with the Trail Historical Society in bringing this exhibit to life. Are you interested in participating in the museum? The Trail Historical Society will be at the Riverfront Centre holding a membership drive on Wednesday, November 7 and to answer questions about the exhibit and how you can volunteer. Newly opened in April 2018, the Trail Museum & Archives exhibits, interprets and manages the collections of the Trail Historical Society from the new Riverfront Centre in downtown Trail. Three dedicated galleries depict the social and cultural heritage of this industrial West Kootenay, known for its sports legacies and industrious roots. The Trail Museum & Archives is a City of Trail facility and is integrated with the Trail & District Public Library in the new centre.